Options 1.0% -- 1.25 fl. oz. 1.0% -- 4 fl. oz. Watching your pet scratch at an itchy, painful ear is no fun. 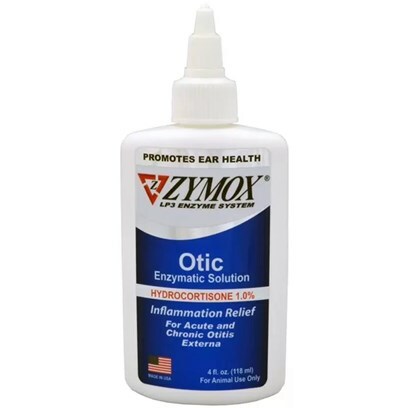 Help your pet feel better with Zymox OTIC. It treats the ear externally for acute and chronic inflammation caused by bacterial, fungal, and yeast infections. There are a lot of different causes of these infections including excess hair, a suppressed immune system, and excessive ear skin folds. The hydrocortisone in the OTIC provides immediate relief from inflammation and itching so your pet can feel better faster. Keep out of reach of children. For animal use only. Do not use with any other topical ear medications as the hydrocortisone might not work. Shake well before use. Apply liberally to un-cleaned ear, filling ear canal. Gently massage and work into infected area. Wipe to remove excess. Allow animal to shake head. Use 1x daily for 5- 14 days. Safe for extended use on persistent cases. Contraindicated in cases of ruptured or punctured ear drums. Not for use on pregnant or lactating females.